When I was much younger, I discovered the science fiction and fantasy section in my local bookstore, and instantly fell in love. In those books, I discovered characters that I wanted to get to know, worlds I wanted to explore, and quests I felt were worthy to pursue. I read each tale with a sense of wonder. One of my favorite authors was C.J. Cherryh, and her Faded Sun trilogy is still, to this day, one of my all-time favorite series. She built marvelous worlds, to be sure, but she filled her books with complex and compelling people, and when you reached the end of each story, those characters stayed with you, like old friends. And best of all, you ended the book with a sense of hope for their future and a bit of a smile. Today, I have a harder time reading science fiction and fantasy. It’s grittier, you see, harsher. Some of the worlds are brutal, filled with grimness, darkness, and death. Are they well written? Of course. They tell marvelous stories, and are best sellers, but I can’t read them. I see darkness in the world every day, and so I need to read something with a bit of light to give me hope. 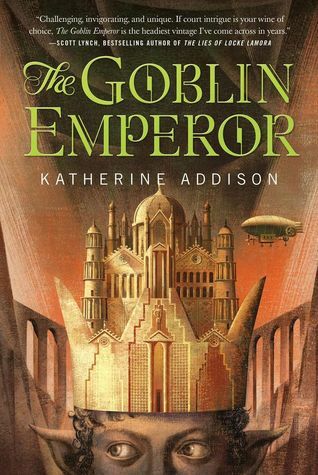 Enter the book, “The Goblin Emperor,” by Katherine Addison. I saw an early blurb about the book, and was intrigued. It sounded like a book from my childhood…and I thought, maybe I’ll give it a chance. And I did. Thank goodness I did; words cannot express how much I enjoyed this book. Maia is the fourth son of the emperor of an elvish kingdom. Maia, whose mother was a goblin, has been exiled by his father after her death, since the emperor already has three other heirs, all full-blooded elves. Maia’s exile is a harsh thing, for he lives in a barren land and is cared for by a cousin he hates. He is lonely, and strives to endure, until one day a messenger arrives, informing him that his father and brothers have all been killed in an accident; Maia, the half-goblin son, is now the emperor. As emperor, Maia finds his knowledge severely lacking. He does not know the people of the court, does not know intricacies of the politics he must mediate, and does not know whom to trust. He is as lonely as he was in exile, and strives to endure. But Maia cares more about the people around him than he cares for himself, and demonstrates this time and time again. This, it seems, is a rare quality in elvish emperors. And so, Maia, in spite of himself, begins to change things for the better. Soon, the people around him see him as more than just “the goblin emperor.” They see him as a valued leader, and in some cases, as a friend. I ended this book with a bit of light to give me hope, and a smile. My hope is that Katherine Addison writes a sequel, and I’ll once again get to spend time with Maia, Cala, Csevet, Beshelar, and all the rest of the marvelous cast. If you read it, I hope you read it with a sense of wonder and a smile. It’s a rare and beautiful book. The Goblin Emperor, available April 1, 2014, in both hard cover and ebook version. I received my review copy from Edelweiss @ abovethetreeline.com, but have already pre-ordered the Kindle version of the book to show my support of this wonderful author.